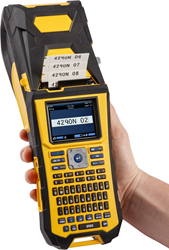 The new BMP61 printer was created to be a trusted and dependable identification companion for users, standing up to tough industrial identification applications in the field or in the shop. Brady (NYSE:BRC), a global leader in industrial and safety printing systems and solutions, today released its BMP®61 Label Printer. This printer is designed for effective and efficient identification of wires, cables and components, with high-performance materials, touchscreen capabilities, data connectivity options and multiple user interfaces. This printer offers application versatility with die-cut, continuous and custom label supplies up to 2 inches wide. It’s ideal for self-laminating labels, cable tags and flags, wrap-around wire labels, heat-shrink wire markers, patch panel labels, asset tracking labels, equipment labels, terminal block labels, safety labels and more. In addition, the BMP61 printer features a utility strap for improved storage and handling, a QWERTY style key pad for familiar typing, and easy menu, cursor and label navigation.